Ducks are a fine source of meat for the small farm or homestead. 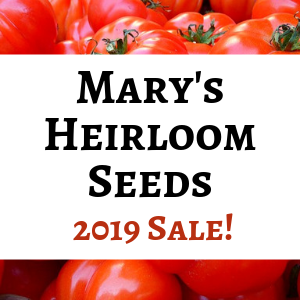 They are fairly disease resistant, easy to care for, and fun to raise. Large breeds of ducks are a more sustainable source of meat for the small homesteader than hybrid broiler chickens. Keeping a drake and several hens will provide fertile eggs for hatching and raising meat to feed your family each year. Pekin ducks raised in a mixed flock. They provide nutritious eggs and meat. Browsing through breeds of ducks in poultry catalogs is fun, and very confusing. There are so many kinds available that it’s hard to choose. 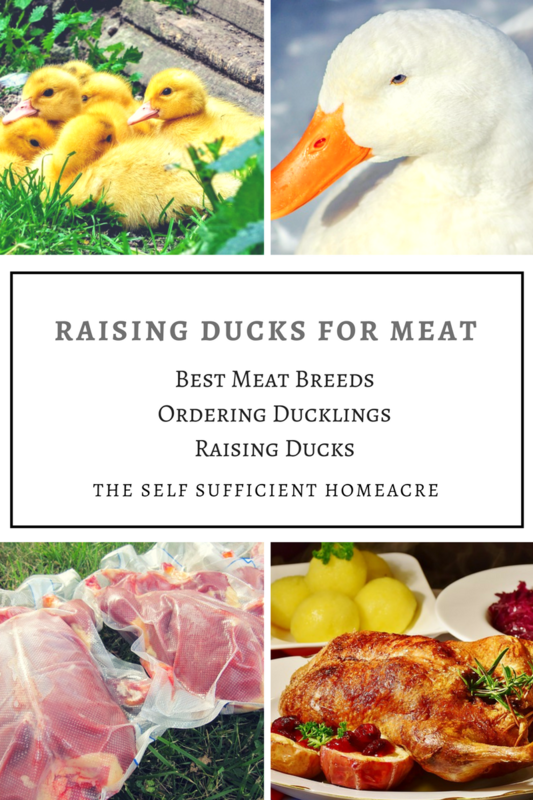 If your main purpose for raising ducks is for meat, you’ll want one of the heavier breeds. The most common are Pekins (aka Giant White Pekins) and Muscovy. Silver Appleyards are a heritage breed that takes a bit longer to reach butcher weight but provides a desirable roasting bird. Muscovies provide delicious meat and will hatch their own eggs. There are other breeds, such as the Rouen, Aylesbury, and Blue Swedish, that will provide a decent size carcass. These breeds have colored feather shafts. Although this does not affect the flavor of the meat, it will make it a bit more difficult to get a clean looking carcass. If you’re planning to raise your ducks for both meat and eggs, the Pekins lay a decent number of eggs plus provide a meaty carcass. This is the breed most often raised for market, because the carcass is clean and they are ready to process at a young age. They are ready to butcher at 7 to 8 weeks, a very fast rate of growth…as fast as Cornish X meat chickens. You can butcher your ducks at any age, but they are much more tender when young. 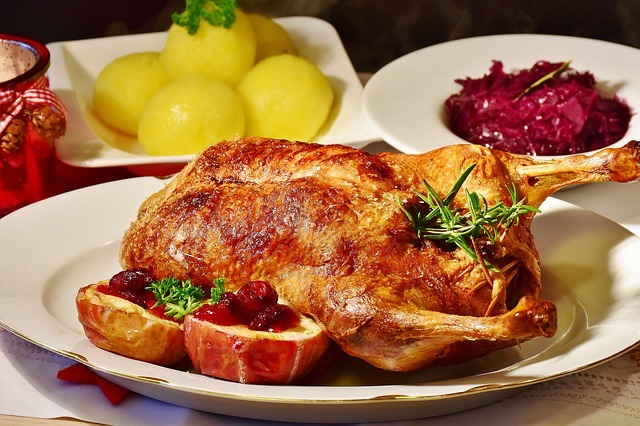 Roast duck – raising your own meat for the table is very rewarding. 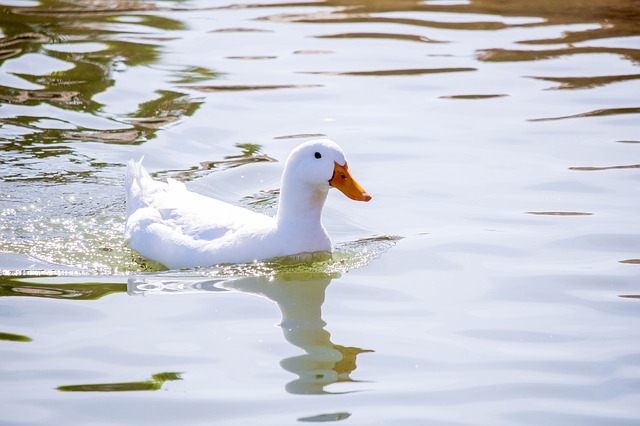 Ducks have oilier skin and meat than chickens since they are adapted to live in water. If you don’t care for the greasiness of most duck meat, try Muscovies. Their oil gland is not as well developed as most ducks and their meat is lighter. Be aware that Muscovies are prone to flightiness and you may need to cover their pen or clip the feathers on one wing to keep them at home. Some states have regulations about keeping them because they have escaped and created problems for local waterfowl populations. Muscovies are also quieter than most ducks and make reliable brooders and mothers. If you wish to keep a breed that will raise future generations without an incubator, the Muscovy may be your best bet. They will often raise several clutches of ducklings each year. 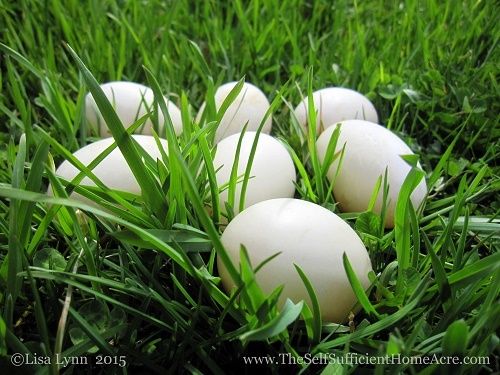 For the self-reliant homesteader, this is an important consideration. 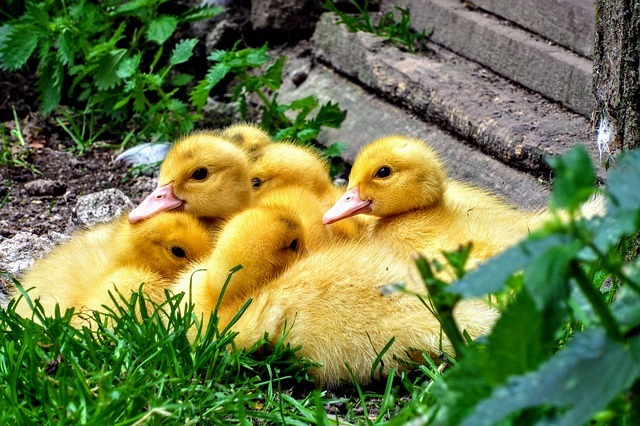 Unless you have breeding stock or a local source for young poultry, it will be necessary to order your ducklings from a hatchery. There are hatcheries all over the world, but it is best to order from a facility close by. The longer the trip, the harder it is on your new ducklings to recover from the stress of shipping. 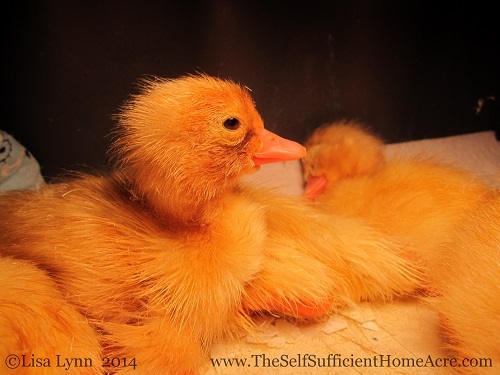 Baby poultry hatch with a 3 day supply of nutrition from the egg yolk to sustain them. If the shipping period is longer than this, you risk losing your little ones to starvation and thirst. Choose overnight shipping for the best results. Check with the hatchery before you order so you know what their replacement policies are. 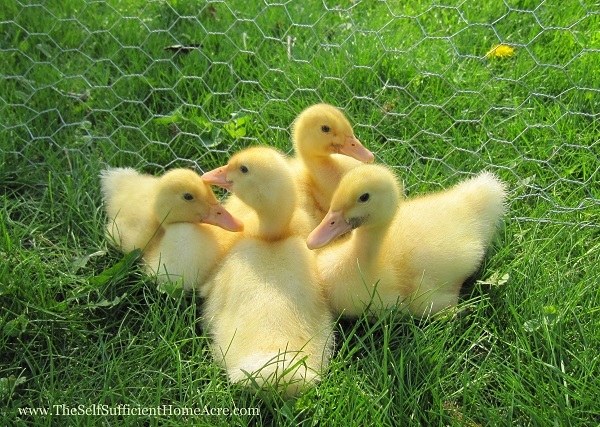 Many hatcheries have a minimum order of 15 ducklings per customer. If this is too many, you may want to split the order with a friend or sell some on Craigslist. Some feed stores have chick days in the spring when you can order small numbers of baby poutry. Be prepared for prices of $5 and up for day old ducklings. Schlecht Hatchery in Iowa has the best price I have found online for Pekin ducks. I’ve ordered broiler chicks and Pekin ducklings from them in the past and was happy with the birds I received. I will say that they are not the best at communicating with the customer about delivery dates, but I am happy with their prices. Their 2019 catalog lists Pekin ducklings for $4.25 plus shipping. Before your ducklings hatch or arrive, you will need to prepare a brooder pen for them. They need a heat lamp or Brinsea EcoGlow Brooder to keep them at 95 degrees F for the first week. Each week afterwards you will reduce the temperature by 5 degrees. If they are crowded under the lamp, they are too cold. If they are as far from the lamp as they can get, it’s too warm. Be sure to check on them often to prevent fatalities from overheating or exposure to cold. Provide clean water and non-medicated starter feed at all times. For the first few days, you may want to put a tablespoon of sugar in each quart of water to provide them with extra energy. Electrolytes can also be added to their water, especially if the shipping process was particularly stressful. Ducklings can make quite a mess in their water dish. Be sure that your little ducklings can’t get into their water container and drown. They are curious and playful, but shouldn’t swim in the first few days, so care must be taken to prevent accidents. 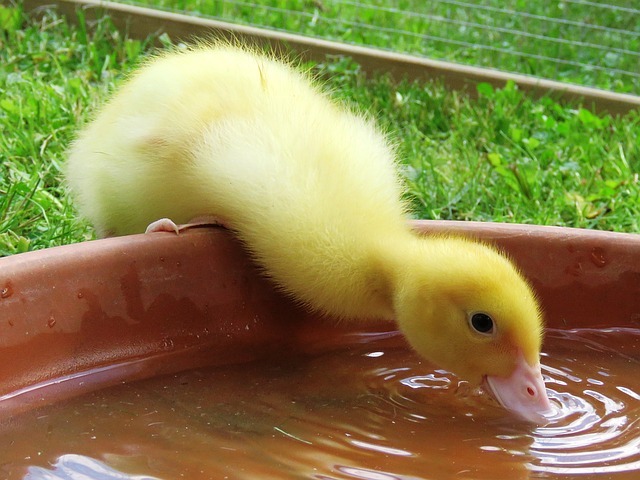 As they get older they will love to swim, but young ducklings should not be left alone with a water dish that is too deep or difficult to get out of. Dressed, vacuum sealed, and ready for the freezer. I raise my own poultry to avoid eating animals raised in factory farms and slaughtered in giant processing plants. I know exactly what my birds eat, how they live, and I can ensure that their death is as quick and humane as possible. It’s impossible to know what conditions they are subjected to if I purchase them from the grocery store. I’m pretty sure I don’t want to know. Even though I have a difficult time butchering my own birds (I’m a big softy), I choose to do it anyway. 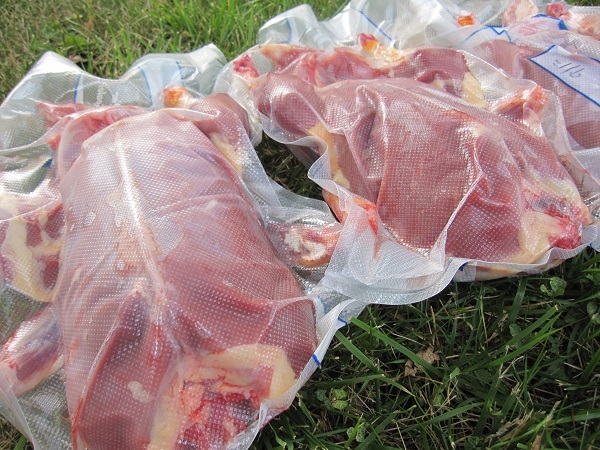 For complete instructions on butchering your ducks, read my post How to Butcher a Duck. The biggest difference between butchering ducks and chickens, in my opinion, is plucking. Chickens are much easier to pluck because they don’t have thick down feathers like a duck. When plucking a duck, I recommend using duck wax to make the removal of down much easier. Pekins lay a lot of very large eggs! Growing up on the farm, we had White Pekins for eggs. My Mom made the most delicious cakes with those large, pale green eggs. I can still remember the fun I had searching for them in the weeds. When we bought our homestead I knew I wanted to keep ducks for eggs again. I ordered 20 Pekin ducks from Schlech Hatchery and butchered all but a small flock for laying. Those duck hens provided us with enough eggs for fresh eating and for hatching out meat birds each year. They were very hardy birds and kept laying eggs right through our cold winters. Of course, they go through a molt each year and would stop laying for about 3 months. Each year they laid fewer eggs until I turned them into duck sausage. Ducks love water…but they don’t need a pond. Ducks are very messy birds, especially in the coop. Their droppings are large and very high in moisture content. You will need to do more clean up if you keep ducks. Keep a clean tub of water deep enough for ducks to dunk their heads under the water. They are prone to eye infections if water is dirty. Ducks should be fed fresh layer feed with calcium and 16% protein. Ducks enjoy free range or pasture with grass. They eat a lot of bugs and slugs. They also like a lot of garden veggies…so they may not be welcome in your garden. Try to keep their pen free of sharp sticks or other debris, as these can lead to bumble foot infections. Ducks make great livestock for a small homestead. They lay nutritious eggs and provide a sustainable source of meat. You don’t have to have a pond to keep ducks but make sure they have clean water to drink and bathe in and they will do fine. I’ve enjoyed keeping ducks on our 1-acre homestead and would like to try more breeds in the future. 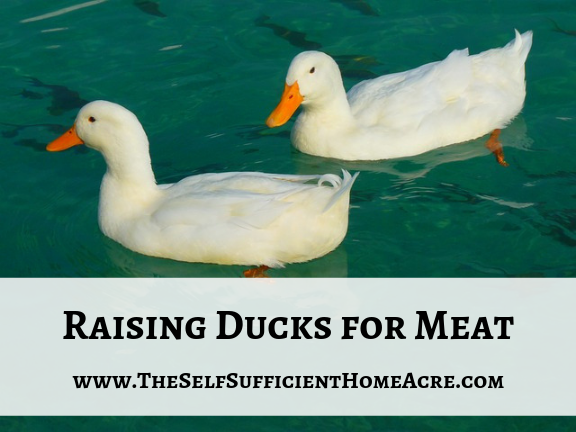 Do you raise ducks for meat or eggs? What is your favorite breed? I’m sorry to hear that your little ducks aren’t acclimating well. 🙁 Is it possible to put some source of warmth in their dog house? If you can’t put a light bulb or heat mat in due to lack of electricity, maybe a hot water bottle each evening to mimic their mother’s warmth? You might want to contact the previous owners to see if the feed you are giving them is the same as they were getting before. You could also try chopping up some lettuce, cucumbers, and tomatoes (just a little) and putting that in with a small amount of food to see if they eat it. They will likely be nervous until they get used to their new surroundings and a blanket or tarp over part of their enclosure for a few days will give them a sense of security. I hope this helps! Let me know how things are going. I am very green at this …just got 4 Indian Runner ducklings about 6 weeks old…it’s been 4 days now and I can not be sure they have eaten ate all…although the pen is open all day they never leave it …they never do into their dog house and I find them in the mornings in their pool…their food bowl looks untouched and I am beginning to consider returning them so they can be with their parents and siblings….any suggestions PLEASE!!!!! I have a friend that raises ducks for meat and he gets chicken crumbles and puts it into a rubbermaid container, adds water til its about 1 in above the crumbles.Mixes it, puts a lid on it and lets it ferment. then feeds it to his chickens and ducks. it helps them digest the food better and it keeps their poo from smelling as bad. you could also get the leftover grains from a distillery and ferment that and feed it to them. Hi Lisa, my name is manju I would like to know what’s is the best food for ducks and grow them faster. I love to hear from you soon thanks. Thanks for writing! Ducks can be fed the grower feed or meat producer feed from the local feed store to get them ready for meat. If you are feeding them the grower feed, you might want to add some extra protein. Most grower feed has an 18% protein content and you could give them sunflower seeds, field peas, fish meal, or soybean meal on the side. I prefer not to give extra soybean, but some people don’t mind. If you don’t have a feed store or access to grower feed, you can mix oats, barley, wheat, and the protein source together and feed them with that. They also love to nibble on veggies (mine love cucumbers) and sprouts for extra nutrition. What advice would you give someone raising ducks for eggs in cold places(Alaska)? I haven’t had any experience raising ducks in really cold places, like Alaska. But I think that you would want to have a well ventilated, but insulated, indoor coop for them. You would need to keep a decent sized pan of water for them to dunk their heads in. They need to have clean, unfrozen water for a good part of the day. So you would need a heat lamp secured safely near their water to keep it thawed for them. I have a water dish heater thingy that goes under a pan of water, but it isn’t supposed to sit in water, and ducks do a lot of splashing around…so I don’t think that you’d want to use one of those. The one thing I would caution you about is that ducks really like to splash around in the water and they will create very humid conditions in your coop…so you need to make sure that the ventilation is good or they may have respiratory issues. Just a thought from a new hobby farmer who doesn’t have her poultry yet but does have horses and always does lots of research; you can get submersible water heaters for livestock water tanks to keep ice from forming. There are a few nice ones you can find on a site like state line tack that will keep however many gallons of water above freezing depending on the wattage ordered, and some may have guards so the animal won’t bump into the heater and burn itself during drinking, or in this case swimming. Just an idea! I got to thinking about your question and did some looking around and found this article: A village-based plan for the small-scale production of ducks, geese and rabbits. by D. L. Slaby and C.E. Lewis. It was published in Volume 14 (January 1982) in the journal, Agroborealis-Alaska, Agricultural Experiment Station, Fairbanks (http://openagricola.nal.usda.gov/Record/AGE82920011). Unfortunately, it is not available online so you will need see if your local library can get it for you. And you won’t need a librarian to get it. Great resources, Philenese! Thanks for sharing! The brewers yeast is for niacin, which helps their legs develop properly. Since most feed stores don’t carry duck-specific feed, it’s sometimes necessary (or just plain easier) to go with a regular unmedicated chick starter supplemented with brewers yeast (and I’ve heard of some who augment with garlic powder, too). Ok, very interesting and good to know. I’d like to hatch some ducks this year so I’ll need to get some brewers yeast. Thanks! What ratio of brewers yeast to the unmedicated chick starter? I have “heard” about adding brewers yeast but no one ever says how much. Thanks! I didn’t find much information, either. About the best I could come up with was “it’s really unscientific.” I just add 1-2 tablespoons of yeast to the top of their food (which is 3-4 cups) when I put it in. Basically, I decided to go with a typical “serving size” as described on the container. One other note: I will say that you have to be religious about changing out the feed, though. It gets wet and ferments in a hurry. Yes, ducks are very messy. 🙂 Water everywhere! Great suggestions. What is the brewers yeast for? Always interested in learning more. Thanks! When brooding ducklings, be prepared to manage the mess. I used a Rubbermaid tote with a front-opening, fold-down door, and I put my water and feed inside the tote, which kept the ducklings from tracking it all back into the bedding. To keep the mess down there, I used a layer of shaving, then a thick layer of straw for great aeration. But the trick for me was to use a rotation of old bath towels on top of all that. I change it once in the morning and once at night, so a rotation of 8-10 towels means no extra laundry, just a load of towels at the end of the week. It’s kept the smell and mess to a minimum, and allowed me to brood my ducklings inside my studio without it being noticeable. One other suggestion for feed additives: brewers yeast. I put a spoonful on top of each bowl of feed. It’s available at most natural food stores. 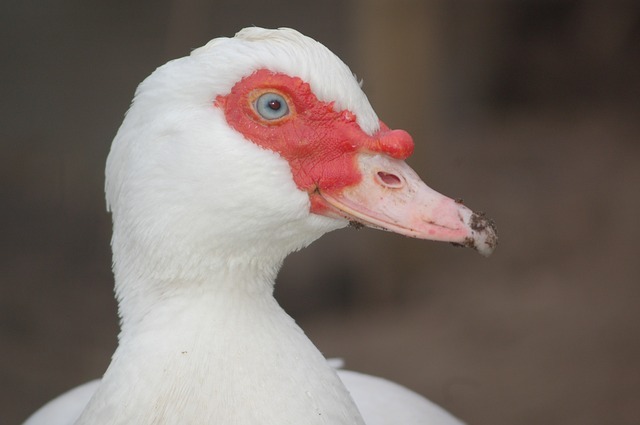 we are thinking of ordering some Pekin ducks (for meat) and have the option of straight run, male or females. If they are raised to 9-10 weeks (on pasture for the last 4-5 weeks), is there a difference between the sexes at that age (size, flavor)? This will be for a dinner for about 35 people, so consistency is important. Thank you! I would suggest butchering at 8 weeks. After that they are more difficult to pluck. I have not found there to be a difference in size or flavor at this young age (or even when they become mature). I find that one duck makes at least 2 meals for the 3 of us. Hi! I hope you have time to answer an important question for me…My husband and I are new ‘farmers’ and we have 6 grown muscovies. Their body of water is a large water basin that is dug into the ground. We have a filter system, and change the water every 2-3 days. I’m a little grossed out by the amount of dirt and feces that still gets into the water, especially since this is also their drinking water. Is it still save to eat these ducks, when their water is so contaminated? That is my biggest question! I’m not at all comfortable thinking about eating them someday. Also, their feces is all over the rest of the barnyard…I’m finding it in the stalls, in the dog’s water bowl, cat’s water bowl, etc…what are we doing wrong? Ducks are very messy. So I can understand your concern. I would provide them with separate drinking water that is changed twice every day. They will mess that up too, but at least they will have the opportunity to drink fresh, clean water. You shouldn’t have any problems if you eat the ducks. If you think about all of the things that chickens peck through and pigs wallow in, it might make you feel better about eating the ducks…or maybe you’ll decide to stop eating meat altogether! When you are ready to process the ducks, you want to make sure that you pen them up and give them clean water but no food for 12 hours prior to butchering. Give them a good long dunk in the scalding pot to help remove as much dirt as possible. Be careful not to empty the feces from their intestines onto the carcass while disemboweling. Wash the dressed carcass thoroughly. If it makes you feel better, you can use a mild bleach solution to dunk the carcass in for a final cleaning, then rinse thoroughly. When you cook the duck, be sure the internal temperature reaches 180 F for safe consumption. I have a tutorial on my blog with complete instructions for butchering a duck…I hope it is helpful if you need it! I would also try to move your pets’ water bowls to a spot where the ducks can’t reach them, but the pets are still able to take a drink. If necessary, you may need to enclose a pasture for the ducks so that their mess is contained and you aren’t stepping in it! Best wishes and let me know how things work out! Hi Lisa! Wow…what an informative and considerate reply! Thank you so much for all of that valuable information…you made me feel so much more hopeful about our ducks! Stay tuned…I’ll let you know how we progress! No problem at all, Annette! Happy to help 🙂 I’ll stay tuned to your duck channel! Hope it all works out! I have a Muskovey drake who will be getting girls soon. A neighbor has a barn coming down so needs to rehome many of her birds. I’m looking foward to duck in the freezer. I’ve been told ducks can be skinned as opposed to plucking too, once less step if you decide on that route. How cool that you will give a home to some of her birds 🙂 I still haven’t tried the muscovies…debating on whether I have the room right now. I skinned the latest batch and it was more work than skinning chickens…the skin seems quite attached to the meat! I did get them finished and it was probably less work than plucking, since they were older birds. But I will continue to experiment. Thanks for the suggestion! We have Muscovies and I love them, I’d never raise another breed. The meat is good, they grow quickly, you can tell male from female in a few weeks and (atleast in the spring and summer) they lay enough eggs to earn their keep. I swear they keep the mosquitoes and flies down too. Last year we had one hatch out 14 ducklings in the barn and only lost 2. The hardest part is keeping them out of the road and off the deck where they like to stare into the house! Thanks for sharing your experience with Muscovies! I will have to try them out. I’ve been wanting to. We’ll see how the Pekins go this summer and then maybe I’ll get some Muscovies in the later summer, early fall. I am very interested in raising Muscovies, especially considering their quietness and what I’ve heard of the meat. I’d have to clip their wings though, we live in a suburban neighborhood! Pekins are an interesting choice, I didn’t know they were ready to butcher so early! Definitely something to keep in mind! I can see why the noise would be an issue 🙂 I’ve read that the meat is similar to beef or pork, but I haven’t tried it yet. And yes, that was my biggest reason for choosing to raise some Pekins…having them in the freezer quickly is a definite plus! Thanks for stopping by and best wishes with your suburban farm! We are very interested in raising ducks both for eggs and for meat. The closest hatchery specializes in Muscovies. I look forward to reading more about it. Well, I sure hope that my ducklings make it here so I can share the experience! I called the hatchery and they will ship next week. It’s just as well, since our deliveries are running way behind due to the flooding. Best wishes with your adventures, Jenny! We got a pair of Blue Swedes last year, and were hoping for meat ducklings this year, but given the status of the eggs currently in my incubator, Sven (our drake), doesn’t seem to have his business quite figured out yet. Gonna give them 10 days before I toss em. Bummer! I had a pair of Blue Swedish last year, but the drake was very aggressive and I sent them to a friend’s house. Unfortunately the hen was eaten by something. 🙁 I’m hoping the Pekins I ordered (if they arrive alive…they were due yesterday) will be more passive. We’ll see. I’d love to raise Muscovies. They might be my next experiment. Having them brood the eggs would be a definite plus!